There have been some pretty famous mice in cartoon history, but only one boasts of Mexican heritage—and the unmistakable voice of Mel Blanc. He’s Speedy Gonzales, the fastest mouse in all Me-hi-co.
You’ll get a chance to see the evolution of this character, as Cat-Tails for Two presents his first screen appearance—in a different form than we’re used to by now. In fact, it took two years for Speedy to get a face-lifting and reappear in a Warner Bros. cartoon. But when he sped off with an Academy Award in 1955, his destiny was sealed. Two of Speedy Gonzales’s subsequent films were nominated for Oscars and they’re both included here: Tabasco Road (1957) and The Pied Piper of Guadalupe (1961), co-starring Sylvester on a busman’s holiday from trying to capture Tweety. Making a special guest appearance in Lumber Jerks are the Goofy Gophers, those elegantly polite but determined little characters who starred in a number of funny cartoons in the 1940s and ‘50s. 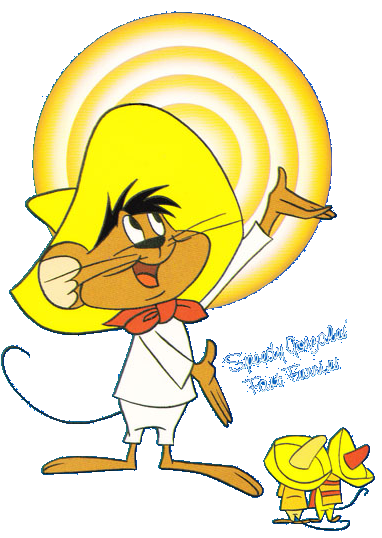 But Speedy Gonzales is the star—and he takes the spotlight with the greatest of ease—and the greatest of speed. Andale!